We are pleased to announce that Cleaves Securities AS has acquired Gersemi Research and appointed the founder and CEO of Gersemi Research, Joakim Hannisdahl, as Head of Research. Cleaves Securities AS is a specialized investment bank focused primarily on the marine, energy and real estate sectors. Cleaves is a privately owned and independent group of companies in investment banking, ship broking and ship management with a 40 year history. The group has offices in Oslo, New York and Singapore. Cleaves has been involved in numerous and highly prestigious marine transactions and thus wishes to strengthen their analytical capacity. Joakim Hannisdahl, CEO & Founder of Gersemi Research said in a comment that: “As our brand became increasingly acknowledged in the shipping industry, the time was right to find more ways to utilize our strong research platform. We have successfully built a proven track record of alpha generating investment advice, outperforming the market and consensus by 270% since 2014, but increasingly had to spend time focusing on non-core parts of our business. Becoming a part of the Cleaves group was a perfect fit and enables us to expand our focus into corporate finance and capital management. This is of mutual benefit for both us and our clients, as we are able to offer many more services under the Cleaves umbrella with our high-quality research as foundation”. 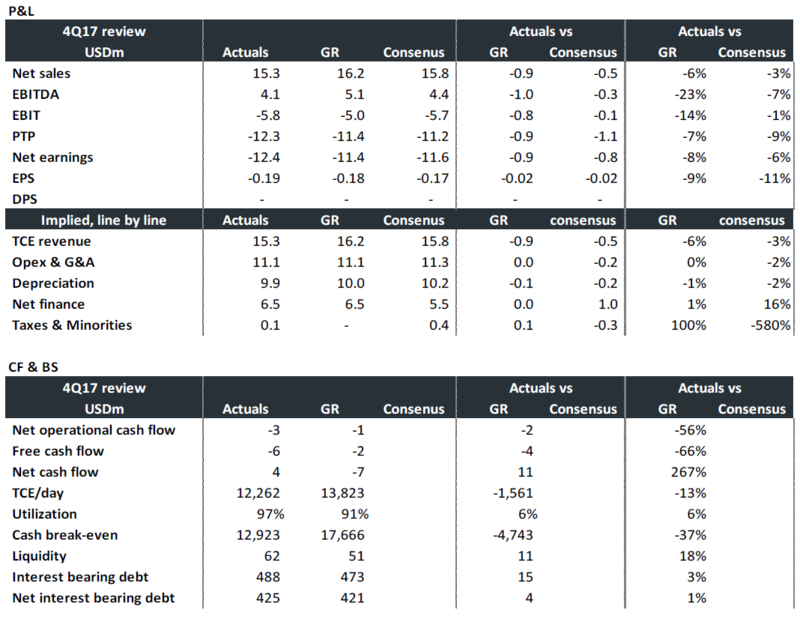 As Q2 came to an end, we analyse the actual data vs our forecast sector by sector, including latest developments going into Q3. We have also added updated peer tables for each sector. LPG Shipping (BUY) disappointed in 2Q18, but short-term improvements are underway. With an escalating trade war between the US and China seemingly gathering momentum, we estimate VLGCs to be one of the hardest hit shipping sectors (excl. containers). The US-Sino trade constitutes ~8% of the global VLGC demand, but we find the picture to be much less gloomy than first perceived. We estimate a potential net impact of only -1.9% if China halts US LPG imports, with a -1.7%p impact on fleet utilization. We reiterate our BUY on LPG Carriers but expect trade war to continue casting shadows over share prices in the short term. 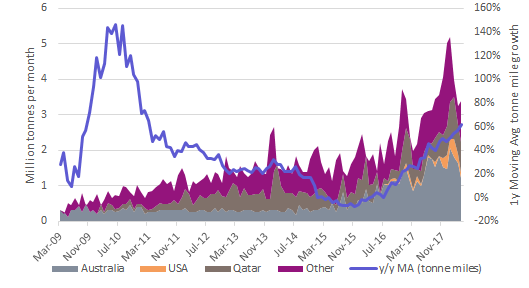 Latest broker quotes are for LNG spot rates at $77.5k/d (+19% w/w, +38% m/m, +94% y/y) with 1y TC at $80k/d (+14% w/w). Spot rates are close to five-year-highs in what is usually the seasonally low period. 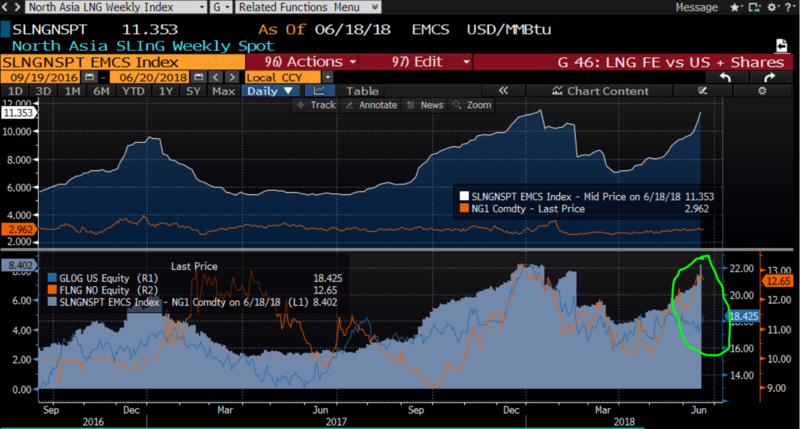 As mentioned earlier this week, strong demand for coal and LNG is leading a surge in natural gas prices in the Far East. New data release on Thursday showed FE prices continued to surge (+8% w/w, +51% since March), with the price differential towards the US (Henry Hub) rising 78% from March as US prices have only moved +12% over the same period. The strong demand is mainly driven by seasonally low inventories and incremental increases in Far Eastern winter demand which is expected to persist. China is also demanding increasingly more LNG, with CNOOC’s recently commissioned 2.2mtpa Tianjin terminal adding icing on the cake. 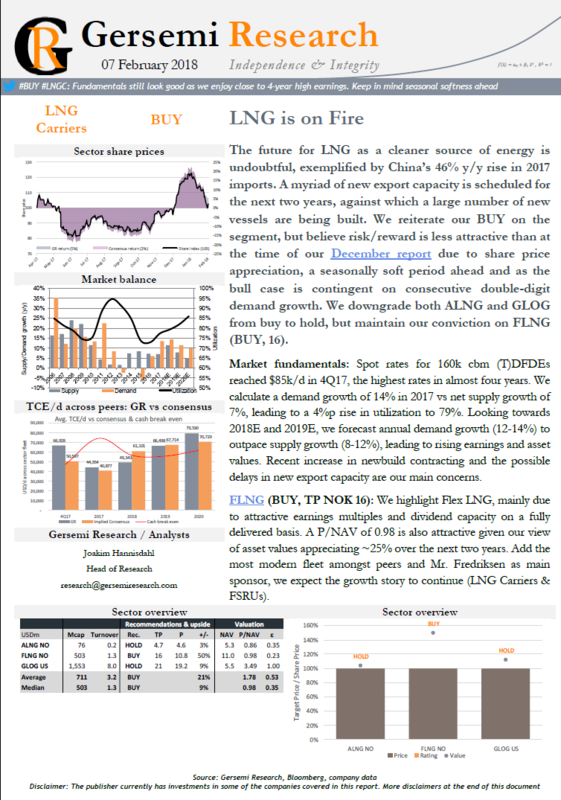 As of April, Chinese LNG imports YTD where up 58% on terms of volumes and 65% in terms of estimated tonne-mile-demand. Our GLOG (BUY, TP 25) purchase on Friday is so far +5%, and we see short-term upside potential toward $20-22/sh. Since our initiation in early April, Hunter has moved ahead on its three options and have added another three to its portfolio. Today, the company announced an equity raise of gross ~$64m which would leave the company fully financed until 2Q19. 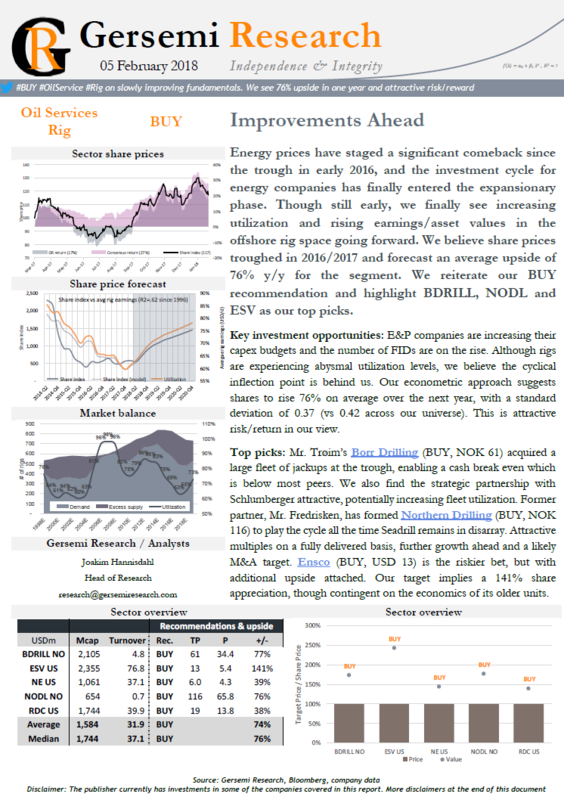 We raise our TP to NOK 5.8/sh (from 3.8) due to the accretive effect of the new equity and as newbuilding prices continues to rise. We reiterate our BUY recommendation with increased conviction. So far, we have perfectly timed our recommendations as far back as 2015 as we foresaw the cyclical peak and have since been awaiting the expected mid’18 inflection point. Given the current price of crude oil, we expect OPEC to increase quotas at the June meeting. This could be a significant catalyst for crude shipping rates from 3Q/4Q18 and beyond. We also expect that global oil inventory net destocking came to an end in 1Q18 and will contribute positively going forward. We forecast VLCCs to average $33k/d in 4Q18 (+103% y/y) and could reach peaks towards $46k/d during the winter season. We believe share prices on average could rally 50-97% by YE’18 and 87-196% over one year. Our Oil Tanker recommendations have returned 27% on average over the past year. This is comparative to a share index with the same shares falling 29% and consensus recommendations on the shares up 6%. Recent chatter on the street is that the cyclical VLGC expansion has been cancelled for 2018. Shares fell 8% today and are down 16% since our March sector report. Thus, it would be prudent to reiterate why we believe 3Q 2017 marked the cyclical trough and that recent share price weakness presents an unseasonal gift to the opportunistic investor. We stick to our BUY recommendation on LPG Carriers and believe VLGC shares could rally 93% on average in one year. The company adds 16 vessels to one of the largest listed fleets in the industry to create a dry bulk behemoth. The deal is neutral on NAV but adds some value per share in terms of forward NAV and earnings multiples. This leads us to raise our target price from $22 to $23/sh. We reiterate our BUY rating and still highlight Star Bulk as a top pick in the dry bulk space. Mr. Arne Fredly is in the process of re-branding failed Oslo-listed oil service company Hunter Group (former Badger Explorer) into a VLCC pure-play, infusing four VLCC newbuilds plus three optional berths at DSME. 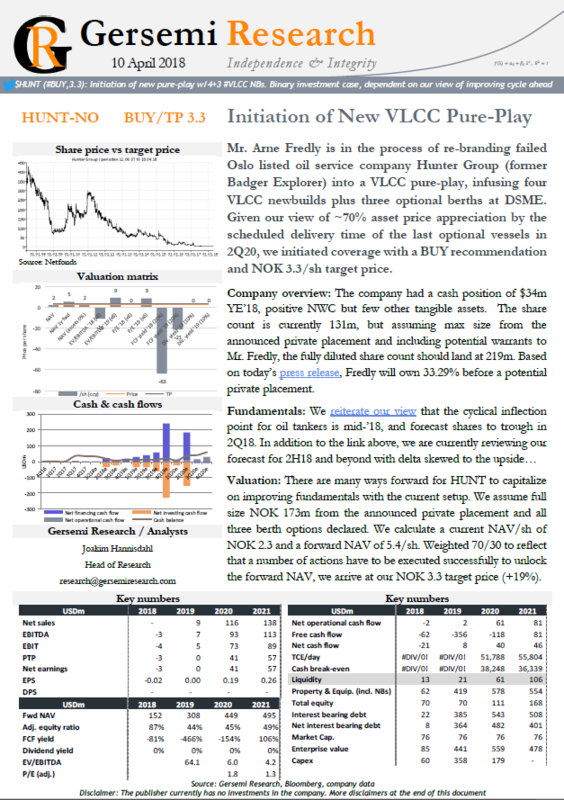 Given our view of ~70% asset price appreciation by the scheduled delivery time of the last optional vessels in 2Q20, we initiated coverage with a BUY recommendation and NOK 3.3/sh target price. Company overview: The company had a cash position of $34m YE’18, positive NWC but few other tangible assets. The share count is currently 131m, but assuming max size from the announced private placement and including potential warrants to Mr. Fredly, the fully diluted share count should land at 219m. Based on today’s press release, Fredly will own 33.29% before a potential private placement. Valuation: There are many ways forward for HUNT to capitalize on improving fundamentals with the current setup. We assume full size NOK 173m from the announced private placement and all three berth options declared. We calculate a current NAV/sh of NOK 2.3 and a forward NAV of 5.4/sh. Weighted 70/30 to reflect that a number of actions have to be executed successfully to unlock the forward NAV, we arrive at our NOK 3.3 target price (+19%). We see the cycle turning to expansion in 2018 as supply growth turn negative and annualized demand growth continues around 10%. We also see signs of seasonal factors materializing, including more US LPG available for export, a rising price differential between Naphtha and LPG and stock building ahead of next winter. Thus, we expect an imminent upswing in spot rates from 2Q18 and forecast shares on average 94% higher in one year. Liquidity: The company reported short term cash of $73m in 4Q17, similar to our forecast of $77m. Further, the company is optimistic in terms of refinancing a $64m balloon payment ahead of its Aug/18 maturity. Assuming successful, our base case is for a minimum liquidity position of -$86m in 3Q19. As we have highlighted time and again, we still “believe further fleet divestments, a debt moratorium and/or further sale/leasebacks” will be needed. 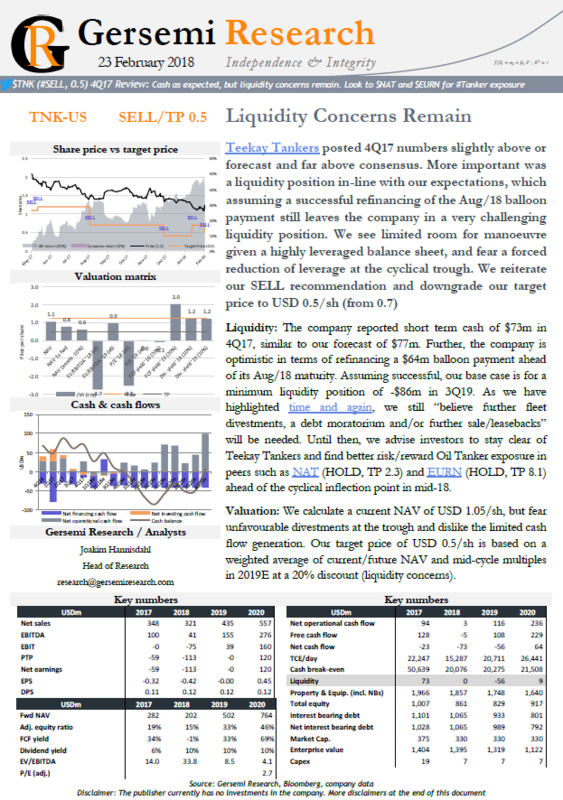 Until then, we advise investors to stay clear of Teekay Tankers and find better risk/reward Oil Tanker exposure in peers such as NAT (HOLD, TP 2.3) and EURN (HOLD, TP 8.1) ahead of the cyclical inflection point in mid-18. 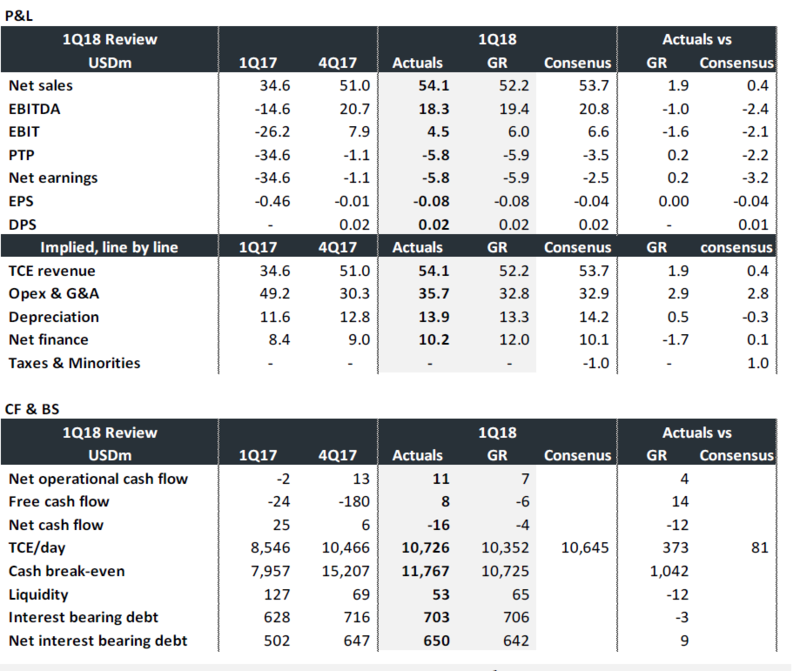 Valuation: We calculate a current NAV of USD 1.05/sh, but fear unfavourable divestments at the trough and dislike the limited cash flow generation. Our target price of USD 0.5/sh is based on a weighted average of current/future NAV and mid-cycle multiples in 2019E at a 20% discount (liquidity concerns). Golden Ocean declared a $0.10 DPS for 4Q17, spot on our forecast but taking consensus by surprise. The numbers were roughly in-line with our estimates but above consensus. The share price reacted accordingly and ended the day +2.8% d/d in Oslo. We reiterate our BUY rating and $12.5 target price ahead of continued fundamental improvements ahead. 4Q17 review: Net sales of $122m in the quarter came in $8m above our forecast ($15 above consensus), although offset by operational cost of $61m vs our forecast of $51m and consensus at $49m. Thus, reported EBITDA of $61m was slightly below our $63m forecast but above consensus at $58m. Net finance was similar to our $16m forecast, but a $2m gain on derivatives and other minor adjustments led to a PTP of $27m which was equal to our $27m expectation (consensus at $23m). The most important event was the reinstatement of dividends after the last pay-out in 2014. After the resumption of regular debt payments, we had precisely predicted the DPS of $0.10 declared for the quarter. However, the announcement took the market by surprise against the street’s forecast of a zero dividend. This is likely the main reason behind the 2.8% share appreciation d/d today. Investment case: Although priced at a 34% premium to NAV vs the peer median at a 2% discount, it is not discouraging as the company has historically been trading at a premium to peers due to its track-record of investor friendly policies. Given our forecast of improving fundamentals going forward, we see an EV/EBITDA of 5.7 in 2019E (peer median at 4.1) and a potential dividend yield of 16% (peer 17%). Although our target implies a 32% share price appreciation, we see higher upside potential in GNK (BUY, 26), SBLK (BUY, 21) and DSX (BUY, 6.7), which remain our top picks in the segment. We also keep a keen eye on BULK (BUY, 198) with listing in NY scheduled for 2018. The 4Q17 numbers were in-line with expectations, with few surprises emerging in the report or presentation. Avance rallied 7% on the day amongst a general appreciation of the VLGC segment. As we enter the seasonally strong period from April to August, we simultaneously expect supply growth to turn negative. Add annualized demand growth of ~10% and we remain highly optimistic on the share price development over both the short- and long-term horizon. We reiterate our BUY recommendation and have a NOK 60 target price. 4Q17 review: The results were largely in-line with ours and consensus’ forecast. The company achieved a timecharter equivalent (TCE) on its fleet of $12,262/day, below our forecast of $13,823. However, this was offset by a utilization of 97% in the quarter vs our 91% forecast. There is naturally a trade-off between utilization and spot rates achieved in the currently depressed market, and Avance struck a balance which was very close to our expectations. Investment case: Avance is our #1 pick in the VLGC space, trading at a P/NAV of 0.54 (peers 0.60) and 1y fwd NAV of 0.34 (0.46) even after applying a China-discount to its applicable fleet. Add historically high operational leverage and we see EV/EBITDA in ‘19E of 4.0 (4.5) and potential dividend yield of 48% (29%). 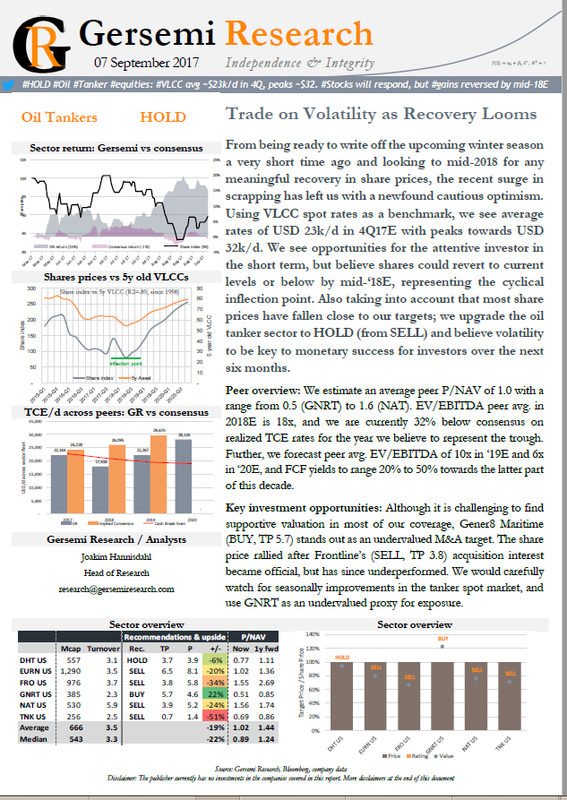 We have generated a 139% return on our recommendations since Mar/14 (vs consensus’ -81%), and see 175% upside potential ahead as the VLGC segment is repriced in concert with the cyclical upturn. Never before have we been so optimistic across all sub-segments of the shipping/oil service sectors simultaneously as we now are for 2018. All segments have either just entered the expansionary phase of the business cycle, or will experience the inflection point in 2018. Thus, we find ourselves in an extraordinary situation where a potential 109% return over the next year is being dependent on careful capital allocation. In this report, we outline our top picks for 2018 in terms of timing, segments and shares, focusing on maximizing return/risk. Key opportunities: We have short- & long-term BUY recommendations on Dry Bulk, LNG Carriers, LPG Carriers and Rig, while we have a short-term HOLD on Oil Tankers. The latter is a tough call as we also see the largest upside in this segment over a one-year horizon. We believe Oil Tanker shares will be weak in 1H18, creating opportunity to accumulate shares ahead of the cyclical inflection point in mid-‘18. 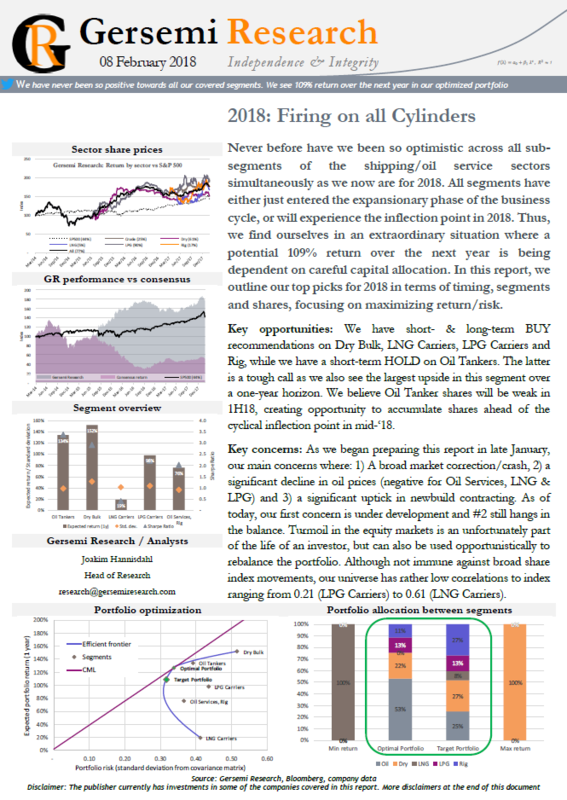 Key concerns: As we began preparing this report in late January, our main concerns were: 1) A broad market correction/crash, 2) a significant decline in oil prices (negative for Oil Services, LNG & LPG) and 3) a significant uptick in newbuild contracting. As of today, our first concern is under development and #2 still hangs in the balance. Turmoil in the equity markets is an unfortunately part of the life of an investor, but can also be used opportunistically to rebalance the portfolio. Although not immune against broad share index movements, our universe has rather low correlations to index ranging from 0.21 (LPG Carriers) to 0.61 (LNG Carriers). The Dry Bulk segment shows continued signs of strength amidst the current low season and as we approach Chinese Golden Week (15/Feb). The BDI has averaged 1,225 YTD (+38% y/y) and Capes $15/k (+43%). We forecast steady rising fleet utilization in 2018E and 2019E with appreciating asset prices as a result. We see a 152% upside to Dry Bulk shares on average over the next year, although at a rather wide range out outcomes (σ=0.52). We reiterate our BUY on the segment as the risk/reward as highly attractive in a historical context. Market fundamentals: We forecast 2018E to be the second consecutive year of rising utilization with demand growth of 4.4% outpacing net supply growth of a mere 1.7%. Net supply growth of 1.8% in 2019E should lead to further utilization improvements, but the recent uptick in contracting is our main concern for the segment and could lead to a cyclical inflection point in 2020/2021E. Before that, we see asset prices appreciating 42% and shares rising 173%. Top picks: GNK (BUY, 26) has a very strong cash generation (dividend potential) and low net LTV in addition to one the highest discounts to NAV. SBLK (BUY, 21) has a similar cash story, but is currently trading close to NAV. However, a higher elasticity to asset values leads to a 1y fwd NAV on par with GNK and DSX (BUY, 6.7). The latter is also supported by a cash flow and NAV story, but ranks sub-par due to management’s conservative approach to both operational and financial leverage through the cycle (=lower dividend pay-out ratio). BULK (BUY, 198) is also a top pick being a large Capesize “pure”-play with listing in NY scheduled for 2018. The future for LNG as a cleaner source of energy is undoubtful, exemplified by China’s 46% y/y rise in 2017 imports. A myriad of new export capacity is scheduled for the next two years, against which a large number of new vessels are being built. We reiterate our BUY on the segment, but believe risk/reward is less attractive than at the time of our December report due to share price appreciation, a seasonally soft period ahead and as the bull case is contingent on consecutive double-digit demand growth. We downgrade both ALNG and GLOG from buy to hold, but maintain our conviction on FLNG (BUY, 16). Market fundamentals: Spot rates for 160k cbm (T)DFDEs reached $85k/d in 4Q17, the highest rates in almost four years. We calculate a demand growth of 14% in 2017 vs net supply growth of 7%, leading to a 4%p rise in utilization to 79%. Looking towards 2018E and 2019E, we forecast annual demand growth (12-14%) to outpace supply growth (8-12%), leading to rising earnings and asset values. Recent increase in newbuild contracting and the possible delays in new export capacity are our main concerns. FLNG (BUY, TP NOK 16): We highlight Flex LNG, mainly due to attractive earnings multiples and dividend capacity on a fully delivered basis. A P/NAV of 0.98 is also attractive given our view of asset values appreciating ~25% over the next two years. Add the most modern fleet amongst peers and Mr. Fredriksen as main sponsor, we expect the growth story to continue (LNG Carriers & FSRUs). 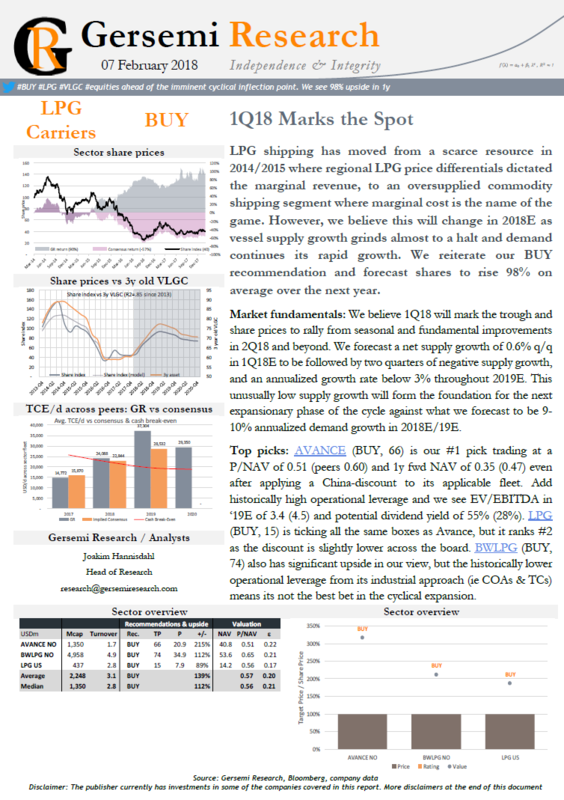 LPG shipping has moved from a scarce resource in 2014/2015 where regional LPG price differentials dictated the marginal revenue, to an oversupplied commodity shipping segment where marginal cost is the name of the game. However, we believe this will change in 2018E as vessel supply growth grinds almost to a halt and demand continues its rapid growth. We reiterate our BUY recommendation and forecast shares to rise 98% on average over the next year. Market fundamentals: We believe 1Q18 will mark the trough and share prices to rally from seasonal and fundamental improvements in 2Q18 and beyond. We forecast a net supply growth of 0.6% q/q in 1Q18E to be followed by two quarters of negative supply growth, and an annualized growth rate below 3% throughout 2019E. This unusually low supply growth will form the foundation for the next expansionary phase of the cycle against what we forecast to be 9-10% annualized demand growth in 2018E/19E. 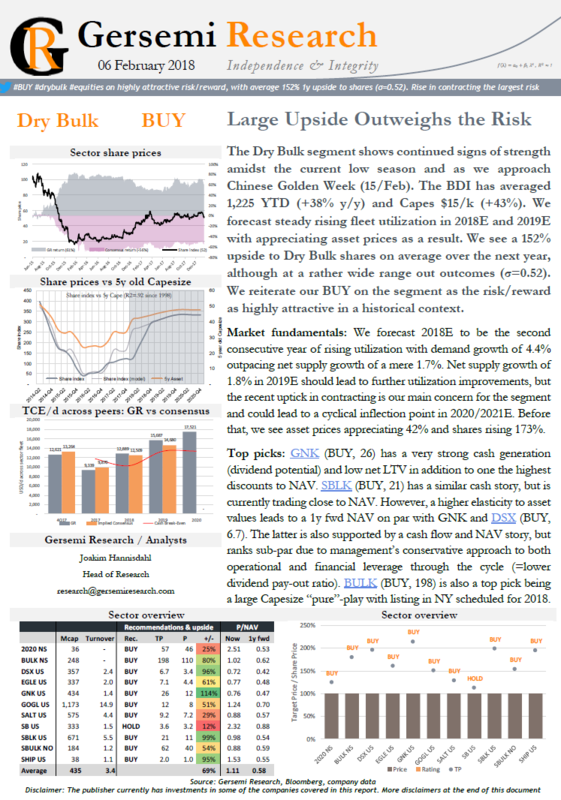 Top picks: AVANCE (BUY, 66) is our #1 pick trading at a P/NAV of 0.51 (peers 0.60) and 1y fwd NAV of 0.35 (0.47) even after applying a China-discount to its applicable fleet. Add historically high operational leverage and we see EV/EBITDA in ‘19E of 3.4 (4.5) and potential dividend yield of 55% (28%). LPG (BUY, 15) is ticking all the same boxes as Avance, but it ranks #2 as the discount is slightly lower across the board. BWLPG (BUY, 74) also has significant upside in our view, but the historically lower operational leverage from its industrial approach (ie COAs & TCs) means its not the best bet in the cyclical expansion. Beside a Hold recommendation during last year’s short-lived seasonal winter market, we have maintained our Sell rating on the Oil Tankers segment due to deteriorating market fundamentals since 2015. We believe the cyclical inflection point will be in 2Q18E and see shares rising 134% on average over the next year, despite short-term downside. Our best play is to use the next six months to opportunistically accumulate shares ahead of the next winter season and consecutive annual improvements. We upgrade the segment from Sell to HOLD, mainly due to share price developments since our last report. Market fundamentals: We forecast net fleet supply of 2.7% in 2018E vs 6.1% in 2017E. The diminishing supply growth is the main reason we believe 2018E will constitute the inflection point of this cycle. Our demand growth of 0.6% in 2018E is very low, and key focus will be on OPEC’s June meeting and supply-side responsiveness to higher energy prices (i.e. US rig count). We expect demand to rise to 8.1% in 2019E on the back of strong global demand and increased exports. Top picks: NAT (HOLD, TP 2.3) is trading at a rare discount to NAV and has by most measures successfully shored up its balance sheet. Were the company to regain yield pricing, we see $5.3/sh by 2019. EURN (HOLD, TP 8.1) recently announced the highly accretive acquisition of GNRT, the main reason we raise our TP from 6.0 to 8.1. For the less risk averse investor, we highlight TNK (SELL, TP 0.7). We see further downside amidst liquidity concerns, but a debt moratorium or other measures could be a significant kicker for the most leveraged company ahead of the cyclical upturn. Energy prices have staged a significant comeback since the trough in early 2016, and the investment cycle for energy companies has finally entered the expansionary phase. Though still early, we finally see increasing utilization and rising earnings/asset values in the offshore rig space going forward. We believe share prices troughed in 2016/2017 and forecast an average upside of 76% y/y for the segment. We reiterate our BUY recommendation and highlight BDRILL, NODL and ESV as our top picks. Key investment opportunities: E&P companies are increasing their capex budgets and the number of FIDs are on the rise. Although rigs are experiencing abysmal utilization levels, we believe the cyclical inflection point is behind us. Our econometric approach suggests shares to rise 76% on average over the next year, with a standard deviation of 0.37 (vs 0.42 across our universe). This is attractive risk/return in our view. Top picks: Mr. Trøim’s Borr Drilling (BUY, NOK 61) acquired a large fleet of jackups at the trough, enabling a cash break even which is below most peers. We also find the strategic partnership with Schlumberger attractive, potentially increasing fleet utilization. Former partner, Mr. Fredrisken, has formed Northern Drilling (BUY, NOK 116) to play the cycle all the time Seadrill remains in disarray. 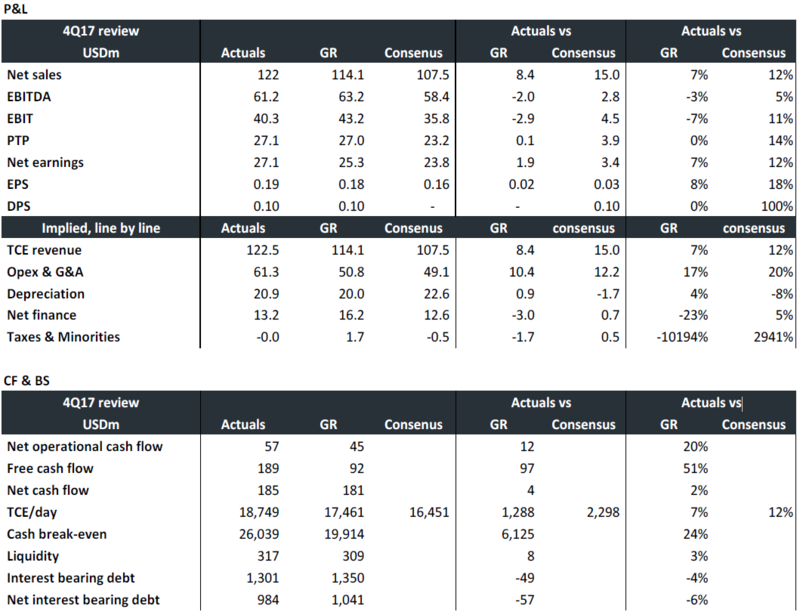 Attractive multiples on a fully delivered basis, further growth ahead and a likely M&A target. Ensco (BUY, USD 13) is the riskier bet, but with additional upside attached. Our target implies a 141% share appreciation, though contingent on the economics of its older units. Although we cannot rule out another dead cat bounce, this year’s winter market has been disappointing. 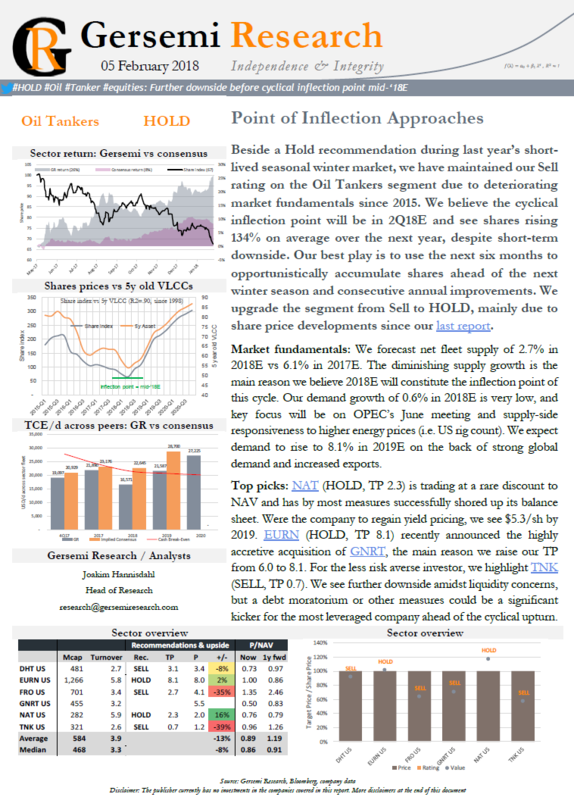 As we predicted, VLCC spot rates peaked at $32k/d, and volatility created opportunities for the attentive investor. However, oil tanker spot rates have averaged $11.7k/d QTD vs our forecast of $13.4k/d, with lower net supply growth (0.3% q/q vs 1.0%) offset by even lower implied demand growth vs our forecast (4.8% vs 7.1%). We downgrade the sector from HOLD to SELL as we see further downside risk to share prices and asset values ahead of the inflection point in mid-‘18E. Peer overview: We estimate an average peer P/NAV of 1.0 with a range from 0.5 (GNRT) to 1.6 (NAT). EV/EBITDA peer avg. in 2018E is 18x, and we are currently 32% below consensus on realized TCE rates for the year we believe to represent the trough. Further, we forecast peer avg. EV/EBITDA of 10x in ‘19E and 6x in ‘20E, and FCF yields to range 20% to 50% towards the latter part of this decade. 2020 Bulkers is the newly established dry bulk investment vehicle of Mr Tor Olav Trøim (50% ownership), in partnership with Titan Opportunities Fund (20%) and former Clarksons Platou partner Fredrik Halvorsen (20%). We estimate a NAV of NOK 16.3/sh, but base our NOK 31/sh target price on a weighted average of future asset price appreciation models after a 10% discount. We believe a small discount is warranted as there are still some road to be covered before realizing the potential value appreciation behind our forecast, including a likely equity raise in order to pay the next newbuilding installments in 3Q18E (or options declared in 1Q18E). The company currently consists of two firm Newcastlemax newbuildings with late 2019 delivery contracted at USD 44.23m each (vs our generic valuation of USD 44.17m). The company also has optional berths for another six sister vessels with delivery from 4Q19 to 2Q20. Given the current USD 10m in equity vs USD 88.5m in paid and remaining capex, the asset value elasticity of NAV is an unprecedented 90%. This means that our TP of NOK 31 implies a resale vessel value of USD 46m, equal to our current generic vessel valuation. 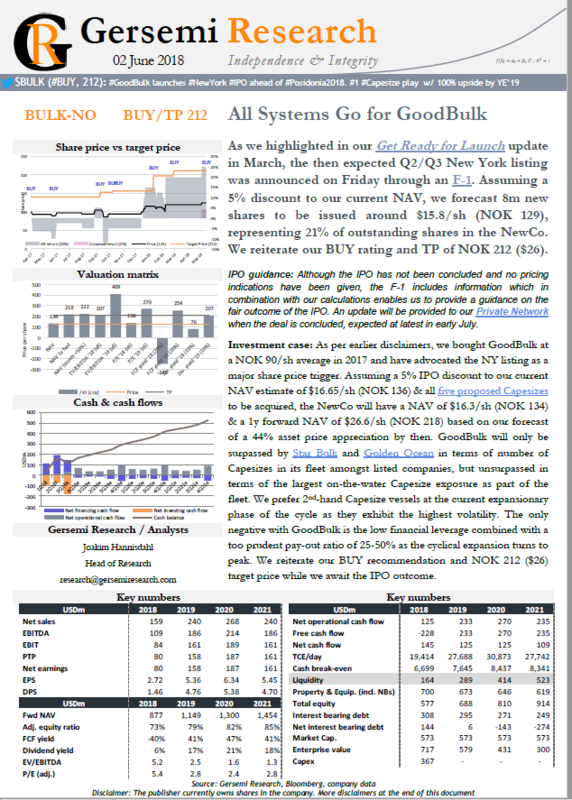 Assuming resale values increase only 10% implies a share price upon point of delivery of NOK 38/sh. The only problem is that these calculation assumes no new equity. We believe leverage will decrease as capex has to be financed. 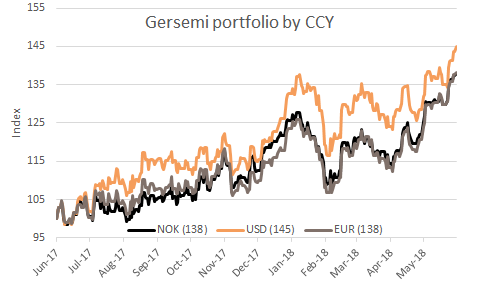 Assuming a LTV of 70% leaves us with a asset value elasticity of NAV of 26%, and a 35% asset appreciation behind our NOK 31/sh target price, which is fair in our view. Thus, we initiate our coverage with a Hold recommendation when comparing our target price vs the “market price” of NOK 30.5 seen in extremely thin trading so far on the N-OTC since listing this Monday. “Off-balance sheet” upside ahead could be provided from news flow and overly optimistic analysts eager for corporate business, which in turn could lead to accretive shares-for-ships deals and rising NAV/sh, all else equal. 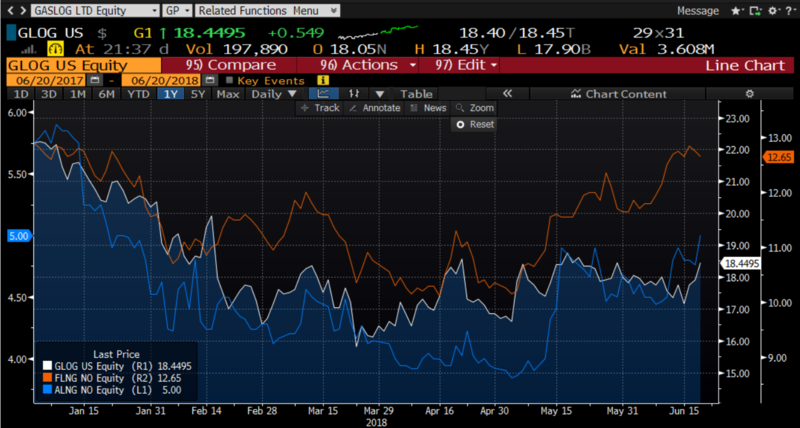 Still, we find better valuation in GNK (BUY, USD 21) and SBLK (BUY, USD 14) looking one year ahead. Before that, we expect the dry bulk space to soften before the year end and into 1H18E, before renewed optimism lifts shares to new highs. Dong-A Spica & Dong-A Capella said to have been sold @ $48 each to two sperate Greek buyers. 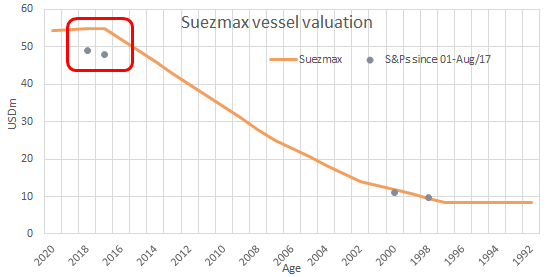 10% below our current generic fair value for a similar vessel, which is under revision for downgrade. Consistent with our September report where we forecast asset values down ~10% by 2Q18E. Last comparable done was the 2018 resale RS Kaystros sold to Polembros @ $49m in late October. Key takeaway: Current asset values below current broker quotes + added downside risk as the Winter market draws to an end around 1Q18.